Midterm elections are 10 months away. And given that they are generally unfavorable to the party in power, the predominant question this year is not only whether there will be a partisan shift towards the Democrats, but if the shift will be large enough to flip control of either (or both) houses of Congress. Factor One – Partisan enthusiasm: Given that midterm election turnout is noticeably lower than in Presidential election years, partisan enthusiasm takes on added importance, especially in close races. JMC believes that this enthusiasm can be measured in advance during primary season, provided that both parties have contested primaries for a statewide office like Governor or U.S. Senator. For example, in the primary season preceding the 2010 Republican landslide, 57% of primary voters in 19 states chose a Republican ballot, while 63% did in the contested party primaries before the 2014 GOP landslide. (REVISED 1/2 PM) While this year’s numbers can’t be tracked until (at a bare minimum) primary season begins with the Texas primary on March 6, last year’s statewide primaries in Virginia and New Jersey (both of which were won by the Democrats in the general election last November) showed that 60% in Virginia chose a Democratic ballot (compared to 43% in the 2016 Presidential primary) while 67% did in New Jersey (67% did in the 2016 Presidential primaries). 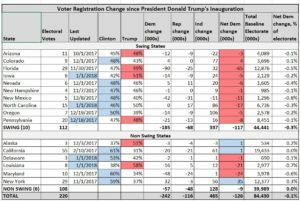 Factor Two – Voter registration changes: Partisan enthusiasm can be measured in another way: in states with voter registration by political party, the change in those numbers since the Trump inauguration can be a good barometer of whether or not the political winds have shifted. From an examination of partisan voter registration data since the Trump inauguration, there has been no discernible movement towards (or against) the Democrats. 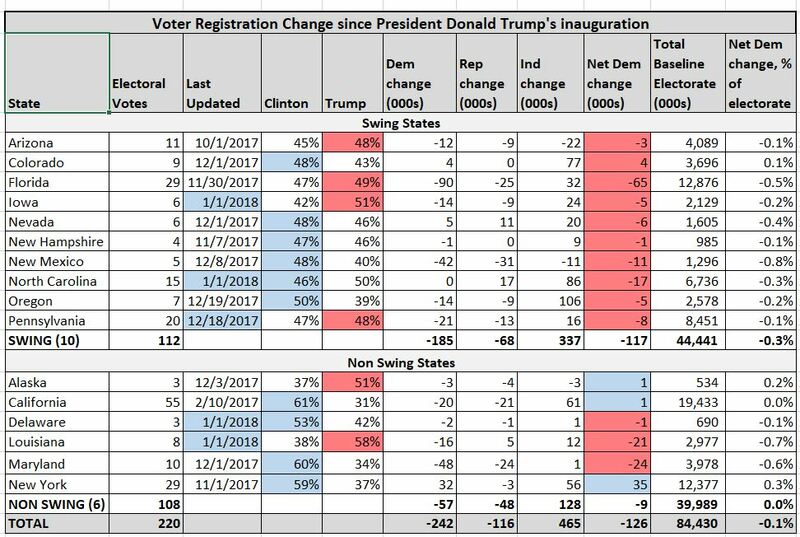 Democrats have lost 126K more voters than Republicans have, while Independents/3rd parties have picked up 465K new registrants – out of a denominator of over 84 million registered voters. Factor Three – Interim election results: This is the genesis of much of the Democrats’ confidence in this year’s midterm elections. Not only did they sweep the two governor’s races (New Jersey and Virginia) on the ballot last fall, but they also scored several pickups in both legislative and county level races. Furthermore, in four Congressional races last year in Republican districts, Republican candidates generally under performed relative to Donald Trump’s showings in those same districts. The recently concluded Alabama Senate race is an interesting case. While it was arguably a case of a Republican candidate who could not establish positive reasons for supporting his candidacy (as evidenced by substantial underperformance in affluent Republican areas), the race also saw robust black turnout, and given the near unanimous support blacks have for Democratic candidates, this (high black/minority turnout) can potentially make the difference in numerous state and local races this fall. Factor Four – Political Climate: This is another area where Democrats can feel confident from an examination of the data. Throughout the first year of the Trump administration, the “atmosphere” has not been favorable to Republicans. President Trump’s average approval rating has been underwater for much of the year (currently 55-40% disapproval, while it was 45-43% approval a year ago). Similarly, the generic partisan ballot has Democrats up by 13 points (48-35% – up from 46-36% during the summer), and poll respondents are pretty negative (58-34%, up from 54-34% negative at the beginning of the Trump administration) about the country’s direction. Also aiding Democrats are the substantial number of Congressional retirements this far – as of today, 27 House (and 3 Senate) Republicans are not running again, while only 13 House (and 1 Senate) Democrats are. And quite a few of those open seats are in marginal districts, which makes it even easier for the Democrats to pick them up, given the current political climate. In addition to the factors listed above, there are some unknown factors that have not yet played themselves out. 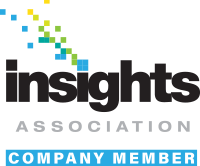 Candidate quality (i.e., the caliber of candidate each party chooses once primary season begins in March) will certainly play a part in the outcome of the November elections. Furthermore, while Trump’s approval ratings have been bad, that does not necessarily mean those numbers will remain bad throughout the year. Plus, with the recently passed GOP tax cut, a big unknown at this point will be people’s perception of whether they benefit or not, since the numerous tax law changes create both winners and losers. Conclusion: While the political climate, interim election results, and partisan enthusiasm favor the Democrats at this point, voter registration changes throughout last year haven’t shown a perceptible shift towards the Democrats. And partisan enthusiasm (as evidenced by participation in upcoming party primaries) can not yet be measured.